Greenfields Garden Services have been pleased to work with fellow Churcham-based internet marketing consultants Quoakle Web Media since 2006. The first project was to create an additional website from the main Greenfields website, promoting extra products and services beyond Greenfields’ core business. This site was launched as Greenfields Plus. Since this time the Quoakle team have increasingly handled Greenfields’ growing web presence. From providing SEO expertise to new designs and new websites targeting niche elements of Greenfields’ diverse business portfolio. The Playground Equipment Supplies website is the most recent addition to a collection of websites promoting Greenfields various strengths and areas of expertise and has been designed by the Quoakle creative media team in association with TCD Web Design from Gloucester. The website was created in 2017 using a WordPress responsive template called Jupiter. 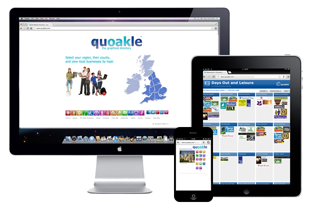 Quoakle’s “flagship” product is the Days Out Directory, Great Days Out. The Creative HQ is based in Churcham, a little down the road from Gloucester, UK. However, some of the team work from locations as far apart as Brighton, UK and Vancouver, Canada. Quoakle offers a wide range of quality web solutions at affordable prices. We can take you from the initial design stages right the way through to marketing your website effectively within Google. To find out more please call on 01452 595377, Skype “Quoakle” or email us at support@quoakle.com.